My daughter's favorite Christmas tree ornaments are a set of cloisonne ornaments and a holiday stocking we bought in China (she came home with us XMas Eve morning 6 years ago). Although, I've purchased other ornaments over the years celebrating her heritage (and we make Chinese lanterns for the tree each year), those ornaments we brought home from China are more important to her because they were purchased in China. I just wish I'd been smart enough to bring more home. That has always, always been my favorite scene in Miracle on 34th Street. It brings tears to my eyes every time. Somehow I always missed that she was adopted. My kids are from the US, so there aren't any big cultural issues. But as far as Christmas ornaments go, I did buy them "first Christmas" ornaments, even though they weren't with us as babies. This is a very touching movie, I can't help but cry when watching this. It is really important to also recognize the child's birth culture, it is one thing that we can't take away from him/her. It's already part of their life, the moment they were born. It's interesting. In the remake of this film (which I watch every year) the little girl is no longer an adopted girl but is deaf. Someone, somewhere, when rewriting the film for remake decided to change that part. I wonder why? You're right though, it does highlight both the loss and gain of adoption, both overseas and domestic. 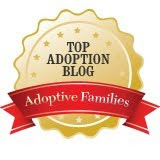 Even within the same country the adoptive family may be so different from the birth family that it is almost a different culture and language. Thanks for sharing this. Design of the blog is fantastic. Color combination is great. Great post. I appreciate this! I have a ant that adopted 10 kids from various parts of the world. I was just wondering if you knew anything about adoption in Hamilton OH? I'm just looking at different adoption agencies but don't really know what to look for. Any insight would be great! I've missed your posts - hope you're doing alright! I hope everything is going well with you and your family. I miss your posts! A Great Cause for Adoptive/Foster Kids!!! JOIN US in this movement of helping adoptive/foster kids to find loving homes ! Donate NOW and get a FREE book! I love your postings, especially this one, and the one on not discussing race. I was adopted by a white family, and I am african american and Indian. Thank you for writing what some are afraid to dicuss. I think you might like this book, that speaks on what you wrote. Its called "Adopting with Biological Children" The name of the author is Brenda Lee Strong, its an ebook on kindle, fairly new. It's ten pages, but the tips worth it. Sorry, I don't have the link to share. Keep on writing!! Donate Just $5 (Rs.325) for one person's Educational needs and Receive up to $5 Millions (38 Cores) in Global Crowdfunding Donations from like-minded people for your needs through a CF magic Portal . Act now to Turn $5 (Rs.325) into millions / crores Easily and Quickly.